In case you haven’t noticed this on the OVA website, they have moved the registration deadline to the Monday (noon) before each beach tournament. Dec 23, 2010. Athletes, parents and coaches – it has been a great Fall and a good start to our season. Thank-you to everyone for their hard work and dedication. Enjoy some down time over the holidays, and we will see you back in the gym in the new year. Happy Holidays! Aug 14, 2010; Sudbury ON. Selected girls and coaches representing OVA Region 4, from cities and towns ranging from Pickering to Trenton, and north to Peterborough, represented Region 4 at the 2010 Ontario Summer Games in Sudbury this past week. Their hard work and twice weekly practices through the summer paid off – they achieved the difficult goal of bringing home the Ontario Summer Games Gold medal. 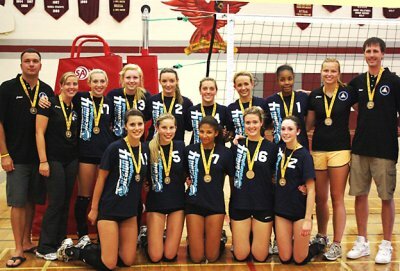 Twelve teams from six OVA regions competed over three days to determine the medal standings. Region 4 girls were undefeated with a 9-0 record going into the final Gold medal match against Region 3, Southwestern Ontario. It was an epic battle. The first set saw Region 3 earn a 21-25 win. The second set was as close as it could be until Region 3 went ahead 17-23. With their backs to the wall, Region 4 re-focused with great serves and defense to almost catch up, 20-23. With the score 21-24 and facing match point, Region 4 bore down and tied the game 24-24, went behind again 24-25, tied it at 26-26 then finally won it 28-26. The third set saw Region 3 go ahead 8-4 when the teams changed sides. But Region 4 pressed hard again with great serves and outstanding defense to earn a very tough fought 15-11 win and the Gold Medal for Region 4. It was a great result for the coaches’ outstanding work and skill, and for a team that practiced and trained so hard and whose mission was ‘to be the best people we can be’. Pictured here from bottom left to right are athletes: Olivia Henderson, Niki Slikboer, Hayli Moore, Chantal Cormier, Shannon Dean, Ashleigh Andzel, Brooke Eibbitt, Abbey Fulton, Becky Wilson, Rianna McNeill and Rayan Bourne. And coaches: Ian Eibbitt, Kristen Collins, Lauren Skelly and Curtis Gilfillan. Last year Durham Attack hosted the first annual Beast of the East National Elite Invitational tournament. Named after the “Best of the West” invitational that features the top teams in western Canada, the Beast of the East included our National Champion 18U Black girls, National Bronze Medalists 17U Black girls, and strong national contenders from Manitoba and Ontario. Along with providing a good tune-up for the teams prior to Provincials and Nationals, it provided a local opportunity for our younger girls to see some great volleyball. This year the Beast of the East is growing and will be bigger and better than ever. We are hosting our 2nd annual National Elite Invitational “Beast of the East” for 17U and 18U girls during the weekend of March 26-28, 2010. After the success of last year’s tournament, we have expanded the tournament to be comprised of 16 elite teams at both age groups from across the country. We are expecting teams all the way from Nova Scotia to British Columbia. The Beast of the East will once again be hosted at Durham College/UOIT. To best allow teams to peak for Nationals, this tournament will be a 3 day event and will closely mimic the National Championship format. The cost will be $300 for Ontario and Quebec teams, and to entice more teams from outside the province, all teams from outside of Ontario and Quebec will have their registration fee waived. As a number of teams have already reserved their spots, please reply asap as spots are limited. Once teams have registered, I will forward all accommodation and schedule information needed. If you have any suggestions or questions please do not hesitate to contact me. Three interesting comments on my Triple-Ball Rant have been received from parents at other clubs… Thanks for taking the time to comment. I read your “Triple Ball Rant” on the Durham attack website. I know you were very involved with the development of this with the OVA. As you know I’ve played competitive V-Ball for years, and was a skeptical of “Triple Ball” when I read about it. Last night, I watched my daughter play her first triple-ball exhibition match. This is her second year playing “Rep” ball with the club. She has an amazing coach, who knows volleyball , and would give his left arm for the girls he coaches. Having played professional volleyball for a number of years, he was not for the triple-ball format, but believes strongly in the principles it is based on (non specialization, basic skill development over winning…etc). What I saw in the exhibition game last night was that her 13U team was able pass set and spike almost every free ball, but was not nearly as successful when they had to serve receive from a much younger and inferior 12U Team. After watching Triple Ball in action I really believe that it will greatly help develop young athletes starting out to play serious volleyball (Public school, or House league is not serious volleyball in my opinion). I believe that there will be longer rallies, and at least 3 times as many pass/set/hit balls, than there would be with regular V-Ball….more touches, and executions + better players all around…but the experts already knew that. It was my first exposure to Triple Ball, and I have to say, I think I’m a believer. Larry, I know it is hard to stick your neck out and promote something new even when it is the right thing. 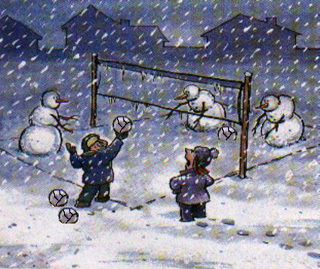 In this world of “instant gratification” it may be a tough sell for the first months, but I believe in the end it will result in better Volleyball players in our youth. Thanks! So here is another observation, that I didn’t post in my rant, as it is perhaps a little too technical for 14U parents who are new to volleyball. Your coach will appreciate it though. Positioning, e.g. when responding to an attack on the outside. If opposing team is attacking on their left side, our middle needs to close the block and our players in 4 and 5 must move to specific positions. Fundamental movement skills at each position. E.g. in the scenario above the player in position 4 moves by ‘open, cross-over, step’ while keeping his eye on the ball the whole time, and finish in a ready position. This isn’t programmed into our kids the way it needs to be. I’ve seen our provincial team coaches trying to fix bad habits in 17u’s doing this, and this shouldn’t happen. It needs to be taught correctly at the entry level and should be second nature very early. To learn these skills we need quality repetitions in a game situation. So the defending team needs to have an opposing team that is attacking properly, not just trying to get the ball over the net. When receiving an actual serve most of the opposing team attacks are out of system, i.e. not good sets to the outside. But the free ball results in much more controlled attacks, and this is going to greatly assist the defending team in learning positioning and movement. What an excellent presentation of information! Statistics that have been used clearly indicate that our approach to developing basic skills has not worked in the past. Your committee’s attempt to look to the long term is so very important for our athlete’s future growth in this sport. As you have indicated if you actually step back and Watch for play completions the numbers are very low at the younger ages,they really aren’t “playing” volleyball. Unfortunately I think in many instances parents look to their child’s involvement in sport as a form of personal entertainment and as such when there is a variance from the “normal” rules that govern a sport they then interprete that as being an inferior product not worth their or their childs time. I too have had children play rep volleyball, in fact four of them. My youngest is playing 14U girls this year. Having watched many different coaches and coaching approaches over the years I must say that I whole heartedly support the OVA and your committee in introducing this new style of play into Ontario. What will be gained by the majority of athletes is what is most important and not what a few disgruntled coaches or parents say. Is it possible for you or the committe to get your presentation of this information out to all of the involved coaches throughout the OVA so that they can at least provide it to parents. I realize that information is available on the OVA website but that is passive in that someone has to seek it out rather than have it placed right before them. Thank you for creating this discussion. I am referring parents to it so they can better understand why Triple Ball is so important. Lots of good points have already been made here which I will not repeat but I would like to recall a personal experience that my son had some 15 years ago in a different sport that speaks directly to this issue. Baseball faced the same issue that volleyball is facing today. At the younger ages, the pitchers could not consistently throw strikes and so every kid, coach and parent knew that all you had to do to win was to stand in the box and get walked. What also happened frequently was getting hit by the pitch which reaped the same reward. The parents supported this emphasis on winning because winning was entertaining and skill development was boring. My son’s team had just finished their regular season and was invited to take part in an experimental game making use of a new-fangled contraption called a pitching machine instead of a pitcher. During that game, I saw kids actually swing at the ball, make contact and run to first base; some of them for the very first time all season. I saw kids who were normally terrified of being hit by the pitch stand in there and play real baseball. Not only did this radical idea result in hitters actually hitting but it also resulted in fielders having to learn how to field a grounder and how to throw to first base under pressure. This change helped all aspects of baseball development. I will never forget the sight of one young girl. She hated baseball because her parents made her stand in the batter’s box against her wishes and she had taken more than her fair share of errant pitches in her back. For the first time all season, she stood on 1st base with a legitimate hit. She was so excited she stood bolt upright, shaking with delight with the only smile I had seen on her face all season. That smile convinced me that this was the way to go. Well, right after the game, the convenors asked all the kids what they thought of playing baseball with a pitching machine but it quickly became clear that they would have to separate the parents from the kids in order to get a true sense of what the kids really thought. Although it was obvious that the kids loved it, the reaction from the parents was overwhelmingly negative. ‘This is not real baseball’, ‘How will we ever develop pitchers for next year?’, ‘Our league will be the laughing stock of the county!’, etc, etc. Although my local baseball association caved in to the demands of the parents, Barrie Minor Baseball adopted pitching machines and so the next season, I signed my son up for ‘Rookie Ball’ and we never looked back. Up until then, Canada had only a handful of baseball players ever make it to the Major Leagues. In the last 5-10 years there have been a slew of them. Is this a coincidence or might it be a direct result of someone having the guts to stick their neck out and do something fundamentally good for the development of athletes despite the objections of the parents. We coach the kids, not the parents. Our obligation is to do what we think is best for the development of their child. In the opinion of experts far smarter than I, Triple Ball will be good for athletic development and so I will get behind the initiative 100%. It should have been done 15 years ago as far as I’m concerned. I have made some improvements to our web site and procedures for 2009-2010. I will continue to post general Club news, but each team will be able to post their own articles to our web site. We encourage you to post articles as frequently as you have something worth writing about, and once we get this going you will be able to post articles and results from anywhere you have a web browser, mobile phone, or email access. Based on what I have seen just this past weekend, multiple teams have already found this easy to do and have posted articles with only a few minutes work. Though our home page may not initially be as pretty as it has been in the past (it will have fewer photos) this will improve as the technology improves. And teams will be able to post articles whenever they wish. If you are a team Communications Rep and want to post an article for your team, send me an email, and I will hook you up to our new Team Blog web site DurhamAttackTeams.WordPress.com , provide instructions, and help you to get your first team article posted.